This is like 22 years ago….what does this have to do with the C3 machine of today? Why dig this up now? T’would that it were so! These incidents raised on this website have EVERYTHING to do with the C3 machine today……. everything! 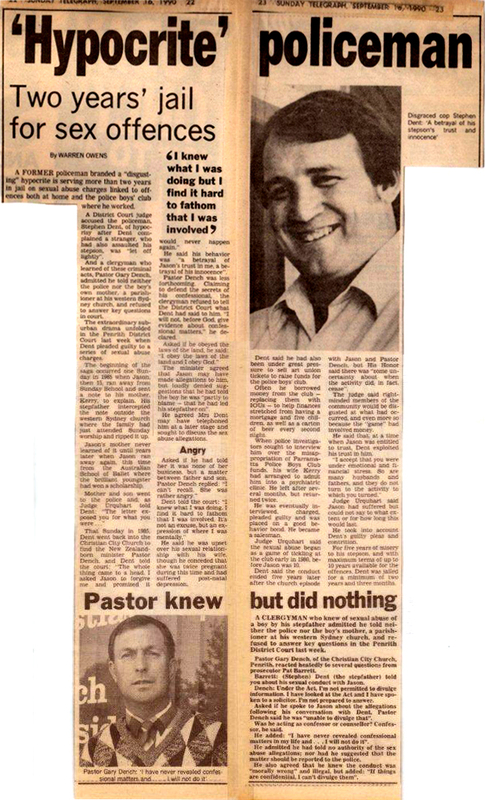 The men involved when these church’s first began are still at the head rotting it from the top down even today – their character has not changed! If Mike could promise me one single day when I didn’t have the sickening picture of these grubs ignoring my child’s cry for help and telling a child that “he must have led his father on” in my mind, then I too would consider that it is too long ago to be concerned. Please try to remember that these disgusting excuses for “men” broke MANY of God’s laws and not just one. “Render to Caesar the things that are Caesar’s”…………… why then did the Pastors involved refuse the Police request to go to court and give evidence on behalf of the child? Why did Dench instead, go to court as a character witness for the perpetrator? Please ask yourselves those questions and don’t stop asking them until you have a plausible answer …… Why on the night, when the first child disclosed, did Dench and Treacy of Christian City Chuch, instruct the child “to ask for forgiveness”.put the lad into the car and send him home with his father – the perpetrator!!! Why did Pringle not even pray for the child as the boy sat sobbing in his presence, begging for help? Why did Pringle and his cohort push the boy and his mother out the door and never contact them again? Ask, ask, ask, and never stop asking…. it is only then your eyes will be opened. May I humbly suggest this……………. if anyone out there thinks it is too long ago to matter, first sit down and read your Bible. Then go to the “men” involved (I will provide names of all of them if necessary) and “correct” them. Insist they go to the victims and sincerely ask for forgiveness – and if they do not………………. REMOVE THEM FROM YOUR CHURCH IMMEDIATELY! Is there any reader of this site who honestly imagines for one moment that Messrs Pringle, Dench, Treacy, McIntyre, McKeon, et al, have not had their attention drawn to this discussion on this website??? Still none have contacted the victims and asked for forgiveness for their part in this. Isn’t that enough to make any sane and right-minded person question where they are worshipping, and to whose voices they are listening. Are we not instructed to go to our leaders when we know they have sinned and speak to them about the matter? Aren’t there strict Bible instructions about how we are to treat such things ? Of course there are, but just like those who watched Pontius Pilate wash his hands rather than do the right thing, so church pews are filled these days with multitudes of folk doing the very same thing. I’m afraid for many C3 (and other) churchgoers, their “idolatery” of the leaders and the entertainment is much more important than God’s word, His children and the love He exhorted us to have for each other. Thank you Fiona, for your gracious and courageous comments……. sadly I don’t have words to express what I think of people who would blindly follow “men” like this and not do their bit to bring these “silent abusers” to account. Bring on a Royal Commission into the part played in sexual abuse of children in ALL Churches. And perhaps the followers in the branches of the C3 church could show their good faith by getting petitions up in all their branches to encourage the Goverment to hold such a Royal Commission!!! Or are they all too busy washing their hands? Fiona, I would like to contact you. Would you contact the owners of this website if you are willing to be in contact with me and they will put us in touch. 2. After recently talking with a victim of this incident – things still haven’t been resolved. 3. There is more of the story to come. 4. This is just another scandal among others within the C3 movement. I’m with Mike, why dig something up that happened 22 years ago? Yes, it happened. How is it possible to resolve this? Perhaps Mr. Pringle has lost his copy of his own book! The “organisation” from which people turn when they experience Mr. Pringle and Co’s shocking behaviour is more often than not, CHRISTIANITY, not just a particular church group. “Mental strength is extremely important. We must be able to put troublesome people out of our minds. They should not be able to distract our focus. This relates to casting our cares on the Lord (1 Peter 5:7).” – Phil Pringle, You The Leader, 2005, pg 165. So ………….. now we have the explanation for Pringle’s behaviour – he just put’s “troublesome people” out of his mind! “Image promises much but produces little. Integrity, however, never disappoints. For me, integrity means living it myself before leading others to live it.” – Phil Pringle, You The Leader, 2005, pg 144. Will someone PLEASE buy a copy of this book and give it to Mr. Pringle! Shame on you Mr. Pringle for writing with such hypocrisy! Firstly, in this matter, Phil Pringle refused to censure Pastor Dench in this matter and took no action against him commenting to the victim and the victim’s family “Dench is a law unto himself”. If Pringle refused to censure his fellow Pastors then over such serious matters, it is a dire warning about the man’s character. Secondly perhaps I may, with the greatest of respect, refer you both to Matthew 5:23. “So if you are offering your gift at the altar and there remember your brother has something against you, leave your gift there before the altar and go. First be reconciled to your brother and then come and offer your gift”. Pringle never offered the family any counselling, never prayed for them, never took action to censure his fellow Pastor and has NEVER offered an apology on behalf of Christian City Church and has NEVER gone to his brother and tried to reconcile……!!!! And NEVER made any contact with the family after he was notified of the issue in order to see how they were doing or EVEN offer to pray for them! What does it matter how long ago events occur if the attitudes or CHARACTER of people never changes Should Christians shrug their shoulders and say “Oh well, this happened a long time ago” when children were caused to stumble? Well, the Bible is pretty clear about what will happen to those who cause little ones to stumble! Do you care what happened to the children who had been molested and raped? The Bible tells us to “test all things and hang on to that which is good”! Perhaps if Christians stopped shrugging their shoulders and instead, examined the way in which their leaders handled the difficult situations, the Church might be thought of as a community with a bit of substance. Waving our hands around and dancing in the aisles is NOT the sign that the church is firmly grounded in Christ’s teachings. If we were able to ask Christ what He thought of this, would He say “Why dig up something that happened 20 years ago”. I think not. I suspect he would ask why leaders that behaved in this way are still in leadership positions, have they repented of their error and HAVE THEY GONE TO THE VICTIMS AND RECONCILED TO THEM…………. The leaders of the C3 church have, time and time again, closed their collective eyes to spouse and child abuse over the years – but I guess as long as the breadwinner in the family is “bringing his full tithe to the store house” the Church is operating as Christ meant it to. In my experience I have seldom heard of a Pastor asking for forgiveness in “real” matters. It’s only when it is a case of some superficial matter and when they know people say “Oh, You don’t have to ask to be forgiven for THAT!” that they use repentance as a way of getting some kudos from others. In the matter referred to, Pringle refused to even meet with the hurting family without “his legal adviser being present”! It seems his priorities were then, as they are now, money!!! The family never made any claim against the church, choosing instead to follow the direction of the Bible not to take their brother to court. The Bible talks long and hard about repentance but it also reminds us that in every matter we also have accountability! Pringle only met once with the family involved and only then to prevent them going to the media, and only with his “legal adviser” present. It seems he was far more concerned about a potential law suit than he was with the souls, mind-set and well-being of the children involved. The children in this family were all “born-again” Christians but turned their backs on the church following the actions of the Pastors of Christian City Church. To Pringle and Company, fancy building are far more important that the temples of the Holy Ghost which were the minds of these children! What would Jeusus say? Yes, I have most definitely do have examples of Pastors of this Church closing their eyes to spousal and child abuse. Unfortunately when people have tried to bring the complaints forward they have been bullied by leaders and members of the church, castigating them for briniging the church into disrepute and for “criticising God’s ordained!” In the case in point, the young boy who went to Dench for help was told “Obey your parents”, “You must have led your father on”, and was then punished by being told he could no longer teach in Sunday school and had to “sit next to his father instead during services from then on”! Pringle had al these matters brought before him and chose to let the children walk away without prayer, without counsel and with the hope they they would get out of his Church and not bring negative attention to it. Any “sane” and sincere Christian would have availed themselves of the transcripts of the trial instead of continuing to follow these wolves. Bullying women and children is nothing new to this lot – and they use the pulpit to defend themselves against any criticism, knowing that the families whom they have damaged have no way to bring them to account . They get rid of them out of the church if possible so that the “problem” is dealt with quietly and without too much fuss. Jesus did NOT spend his time preaching endlessly on tithing and finances but he DID preach endlessly on love. Those who follow Pringle mindlessly, need to look at him and his church objectively. Is he a model of Christ himself and is his church the model that God gives us the blueprint for in the Bible? “There is no perfect church”, we often hear………….. well there should be, the Bible gives us the blueprint. Unfortunately it is very difficult for Christ to build a “perfect ” Church around the egos of many of its leaders who appear to have forgotten that they are SERVANTS, not masters. It’s about time we all asked ourselves if we go to church to be entertained or to worship our precious Lord and Saviour.